Picked fresh from the farm, our Love Out Loud Bouquet is ready to celebrate love and romance! 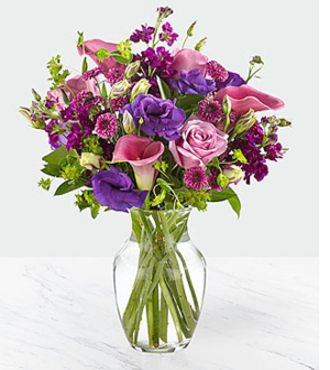 Hand gathered at select floral farms, this stunning bouquet brings together a bold selection of purple blooms to create a stunning gift of flowers. Picked fresh for you, this gorgeous bouquet is a wonderful expression of love to send to your favorite family members, friends, or that special someone. Bouquet includes: purple gilly flower, lavender roses, hot pink calla lilies, purple button poms, bupleurum, and lush greens with a keepsake purple glass vase.